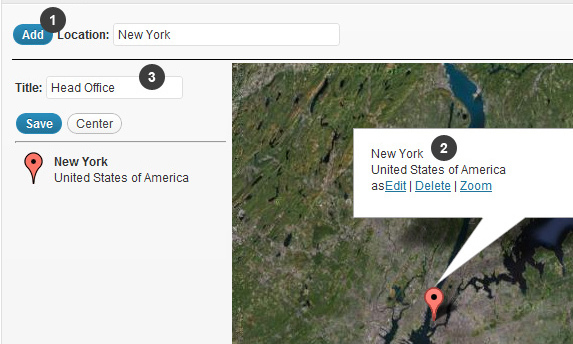 On the next image and in your dashboard you can see new menu item called “Pages”. 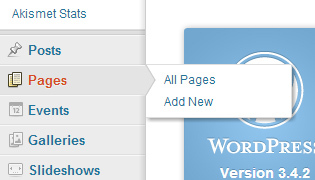 This is where you can organize and setup your pages. Using shortcodes, layout settings and custom sidebars, you can create completely different pages. Starting from, text based, “about” page to contacts and portfolio. Despite the fact that our theme comes with different shortcodes to help you build your page, creating good looking page content still requires at least knowledge of basic html tags and understanding of html/css (http://www.w3schools.com/html/html_basic.asp). Do not copy/paste shortcodes code. Use shortcode buttons. This is the most common problem, people always lose some pieces of code or trying to add in shortcode functionality that it doesn’t has. Use column shortcodes to organize your content. Add clear tag after each group of columns (but not after each column!). Do not use fixed width when you add images or video. If you added video to page set it width to 100% and wrap it with column if you want change it width (display area). Setting fixed height mean it will stay with the same height all the time, even on devices, what means it won’t be responsive and will break your content. After that you’ll see content editor (1), where you can find shortcode buttons (2) in visual mode, and lots of metaboxes (3-5) if you scroll down, below the editor. 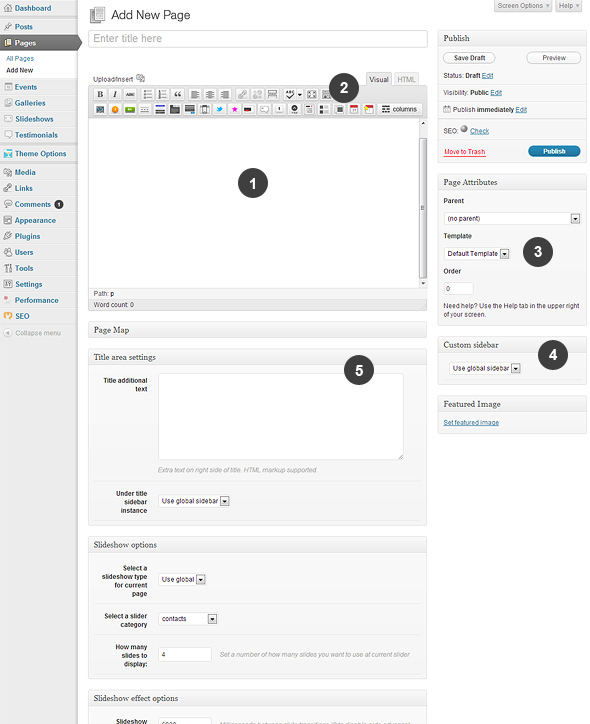 Metaboxes is where you can set different settings for your page, such as: set slideshow (5), sidebars(4,5), layout(3), seo, etc. You can also set parent settings for pages (3). They will be used for building breadcrumbs or custom menu. You can set one of three possible layouts for page: Full width, Left Sidebar and Right Sidebar. You can select layout from “Template” drop down at the right side in “Page Attributes” block. After you set layout, for example “Right sidebar”, you need something to be displayed in that sidebar, so you need to set your sidebar in “Custom sidebar” block at the right side of the page edit screen. 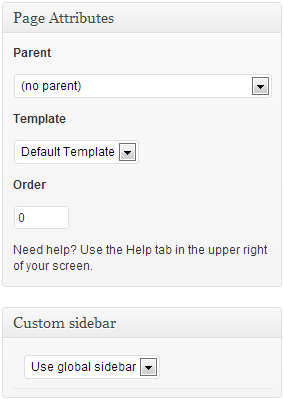 You can create custom sidebars in Theme Options -> Sidebars. There is additional widget area between title and content. You can enable it by choosing Under title sidebar instance in “Title area settings” block below the editor. To add this descriptions simply add your text in “Title additional text” field. This option can be found below the editor on the page edit screen. 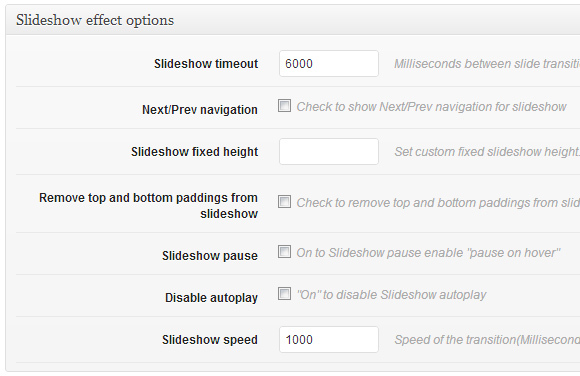 To set slideshow for specific page, scroll down to the “Slideshow options” block.